Neutral Density (ND) filters are an essential addition to any filmmakers kit, particularly when attempting to get a proper exposure or a shallow depth of field when shooting outside in bright conditions or with strong sunlight. Now available in Europe via exclusive distributor Octica Professional, TRUE ND filters are made in Japan utilising the very latest filter technology and offer true neutrality. 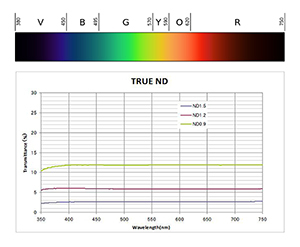 As you would expect from a Japanese manufacturer TRUE ND filters are produced under strict pollution free conditions to ensure that quality and tolerance are exact from every filter, every time. Unlike other filters that have their filtration sandwiched between glass plates, TRUE ND employ a metallic alloy film on both sides of the glass. Troublesome infrared is also filtered out by its flat spectral curve up to 750nm. True ND is simply how ND filters are supposed to be. The TrueND's are the best filters to use with the PMW-F55, since they give no colour tint like some other near infrared filter solutions. They are very clean, consistent, and handle any IR contamination fully without any colour shift. The quality of ND filtration should never be overlooked and is incredibly important when using modern digital cameras outside. As the sensitivities of sensors increase they become harder to filter when used in bright light especially if you want that ultra-thin depth of field look. Without ND, you cant shoot outside in the bright sun without compromising your shutter speed/angle. While a lot of modern day video cameras have built-in ND and IR protection even these can produce a certain amount of colour shift. Although costing slightly more than traditional ND filters TRUE ND reduces and in many cases eliminates the need for time consuming and expensive colour correction, TRUE ND filters are a must for all who want to walk away from a shoot with colour accurate footage, allowing editing times to be reduced, making professional &accurate ND filtration critical. Available in two sizes, 4x5.65 & 6.6x6.6, and currently in five gradients 0.3, 0.6, 0.9, 1.2, 1.5, filters can be ordered as full sets or individually, TRUE ND filters are a must for all filmmakers requiring true ND filters. For further information on the TRUE ND Filter range please contact Octica Professional Ltd.